WORTHING Rugby Club’s under-16 team have recently returned from a once-in-a-lifetime tour to South Africa. The Rugby World Cup starts next month and both matches at the Amex Stadium are sold out. South Africa will be one of the four teams to be based in Brighton during the group stages, with the World Cup itself hopefully visiting Worthing during the bank holiday weekend. As rugby fans around the world count down to what should be the biggest World Cup in history, 28 players representing Worthing Rugby Club have just returned from South Africa on their first rugby tour to the country. The players, all from the unbeaten under-16 age group, had the opportunity to participate in the once-in-a-life time trip to Cape Town where they played four different teams in probably the hardest matches they had ever played in their lives. The games were selected to give the boys challenging matches in contrasting areas in the Western Provence. Worthing’s touring team saw first-hand how every- day South Africans live in extreme poverty, with the associated dangers of such hardship, or are fortunate to be from more affluent communities. The boys were welcomed everywhere they visited with warmth and friendship that reflects the game of rugby. The rugby matches were played in great spirt with Worthing winning all of their games. The Worthing team carried out some volunteering in conjunction with an organisation called Projects Abroad. They also supported Altius Collegians RFC with a donation, a community club which helps potentially vulnerable young people and provides them with opportunities to break out of the poverty cycle. 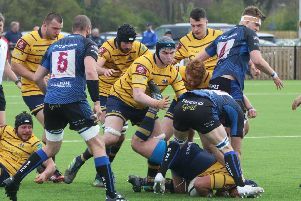 Worthing were the first international team to play at the club and the community leaders were thrilled with the support they received from Worthing and the intention is to continue to support the Collegians through player sponsorship. While in Wilderness, the boys met a touring Argentinian side, which resulted in an unplanned game of beach touch rugby. It was not all rugby, Worthing also managed to visit Robben Island where Nelson Mandela, the former president of South Africa, was incarcerated for 27 years for his role in the anti-apartheid movement. They went on a safari and came face-to-face with lions, elephants, giraffes, and rhinos. The team also went up Table Mountain and canoed down Touw River. Brian Vincent, chairman of Worthing RFC, said “Worthing RFC is a community club, providing a place for children and young people to learn new skills, to learn about teamwork and respect as well as having fun. “We are looking forward to the Rugby World Cup and are preparing to welcome new members who want to play rugby as a result of the competition.